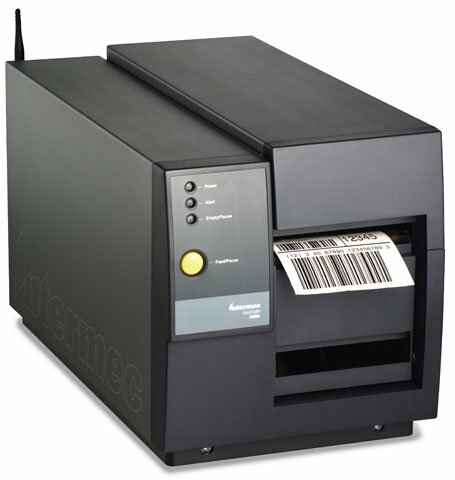 Intermec EasyCoder 3400e - Thermal transfer, 203 dpi, 6 ips, 4.5" print width, parallel & serial interfaces. Includes US power cord. Order cables separately. See accessories. The EasyCoder 3400e is a versatile industrial strength printer. The EasyCoder 3400e is a versatile industrial strength printer based on the rugged, field-proven EasyCoder 3400e. The attractive gray metallic color of the EasyCoder 3400e fits in industrial or office environments. The EasyCoder 3400e features up to 10 times faster printing throughput compared to the 3400, making it ideal for today's increasingly complex labels combining 2D barcodes, mixed fonts and graphics - no waiting for labels. All units ship with product documentation. Includes Intermec LabelShop START barcode label design software. 4" x 1" Thermal transfer paper label. 5333 labels/roll, 8 roll case. Also available as a roll (Part# E06724-R). 4.1" x 500' Black Wax-Resin Ribbon, Compatible with Industrial printers and Polypropylene Labels, Rolls per Case: 12, Core Size: 1"
2.795" x 500' Black Resin Ribbon. Compatible with Industrial Printers. Single ribbon. Used with polyester labels. Replacement Printhead Kit, 203 dpi. Compatible to part number 059003S-001. The Intermec 3400E01000200 is also known as Intermec Technologies	INT-3400EX01	.